THE CENTRAL BANK will track a “critical mass” of restructured mortgages that are due to come up for review in the future, according to the Minister for Finance Paschal Donohoe. While the bank states that short-term arrangements with homeowners can be “appropriate and sustainable depending on a borrower’s individual circumstances” the Central Bank will track the loans as the arrangement comes up for review. The Central Bank’s latest review on the Code of Conduct on Mortgage Arrears (CCMA) vulture funds make more effort to engage with people in mortgage arrears than banks do. The report, which was published today, states there is “no evidence” that vulture funds are failing to engage with borrowers in arrears. It also said there was no difference in the number of repossessions by vulture funds and banks. In addition, it claims vulture funds are “considering” more debt-solution arrangements than the banks. On the foot of the report, Finance Minister Paschal Donohoe said today there will be no change to the code of conduct, as it is working effectively. However, David Hall, founder of the Irish Mortgage Holders Organisation said today’s report “is a masterclass in spin” from the Central Bank and the finance minister. Speaking to reporters today, the minister said that when a loan is sold to a vulture fund the existing arrangement the borrower had with a bank is honoured. He added that this is the case “until the agreed term comes to an end”. At this point, the minister acknowledged the homeowner may then be offered a “different arrangement” from the vulture fund. He said there is no evidence that borrowers whose circumstances have not changed have been moved off existing arrangements “during the term of the arrangement”. 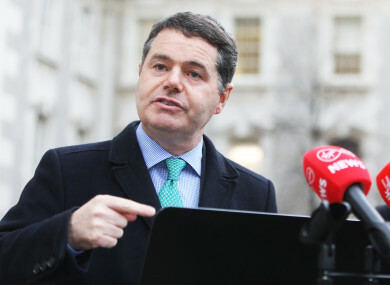 When highlighted to the minister that many arrangements reached with mortgage-holders are for a short periods of time – such as six months to two years – and have a review mechanism in place, Donohoe said the report does look at the term of the arrangements with customers. He said the reason why there are review clauses in many loan agreements or many restructured loan agreements is a person’s financial circumstances can improve. A review clause of an arrangement gives the bank or vulture fund the opportunity to review the operation of the new loan and see if the person’s circumstances have improved, and if they can pay off more of their debt or if they cannot. “The report does look at that period of review and does not find evidence that there are examples of credit firms or lenders looking to act inappropriately to people at that point,” he said. Hall said once a time-limited arrangement, which may have originally been struck with a traditional bank, but the loan has since been sold to a vulture fund, ends, there is a real uncertainty about what actions a vulture fund will take against a mortgage-holder. What if a mortgage-holder had reached an arrangement of a split mortgage with its bank before being sold to a vulture fund and the vulture fund does not do split mortgages? What if the time period for the arrangement ceases, a review takes place by the vulture fund, and they want to call in the loan, what happens then, asked Hall. The minister told TheJournal.ie today that when an arrangement is reviewed, it may not always be the case that a vulture fund will decide not to renew the arrangement. He said a vulture fund might want to hold on to the mortgage loan. He added that many of these arrangements or deals with customers were made during the recession. “That being said, the next step of the report, it does say that as we move further down the economic cycle more loan will get to a different point in their maturity cycle and this is something that needs to be monitored even more in the future because if you have an agreement or a restructured mortgage or restructured loan and many were made at a point in difficulty in our economy will get to a point in the medium term at which a critical mass of them come up for review and this is something the Central Bank says needs to be looked at in the future,” added Donohoe. However, Fianna Fáil Finance Spokesperson Michael McGrath said the report shows there is a greater reliance on short-term arrangements and that vulture funds are not in the game for the long-term. “This is consistent with the fact that they are working to a short-term business model and have no interest in working through a distressed mortgage over a prolonged number of years,” he said. The Central Bank states that it “cannot interfere with the strategy and commercial decisions” of banks and vulture funds, but it will “investigate patterns of behaviour which suggest that the code of conduct process is not being followed as these arrangements reach “maturity”. Fianna Fáil’s private members’ Bill to regulate vulture funds will go to Report Stage in the next couple of weeks. The minister, who is working with Fianna Fáil on the Bill, said it is hoped it will be passed by the end of the year. Sinn Féin’s Pearse Doherty called for a complete ban on selling mortgages to vulture funds adding that his party is calling out the government and Minister for Finance for standing idly by while banks throw their own customers to the wolves. He said the government should be demanding that the banks do the heavy lifting of restructuring these loans, coming to agreements and working through their loan books. The minster also ruled out any future ban on home repossessions, stating that it would have very “profound consequences” to Ireland’s mortgage market and have serious consequences to the rates on lending. Email “Central Bank to track a 'critical mass' of restructured mortgages that are due to come up for review”. Feedback on “Central Bank to track a 'critical mass' of restructured mortgages that are due to come up for review”.